This unique informative set of Laser Patient Education Brochures explains the most common laser dentistry procedures in an easy to understand format designed for patients. 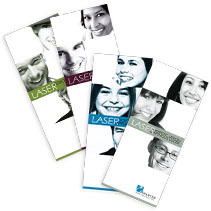 The brochures highlight the benefits that laser dentistry offers for various procedures. Whether you offer the full range of laser dental procedures or just a few you will find this series invaluable in explaining treatment options to your patients. With all major laser applications covered this series can save you valuable time and give your patients something to take home to discuss their treatment with family or friends. Each set comes with an area for you to stamp your information so that patients can give them out to family members or friends in order to recommend your services.